Besides writing this blog, I also write for a website. 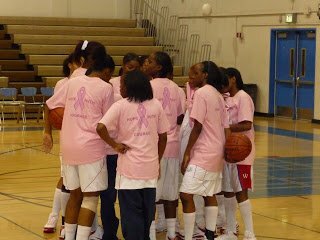 And I just finished a story for that site on the Washington Prep vs. Lynwood breast cancer awareness game last night at Prep. I can’t get hold of my editor right now to see if she’s going to put it on the part of the site for subscribers only, or the free access part. So until I hear from her, I can’t post that story here. I may still, but I’ll come up with a different and less strictly journalistic version for this space. The Generals warm up prior to the game in their specially-made shirts with the school mascot on the front. In the huddle scoping out the Lynwood Knights. 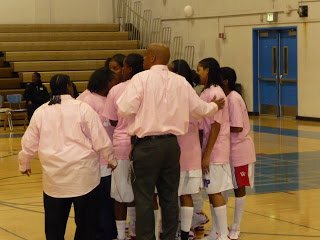 In the huddle with Coach Ricky Blackmon and Assistant Coach Porchia Brown. 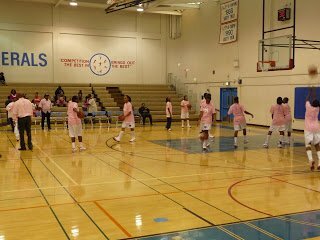 Lynwood wore pink socks with their regular uniforms, so weren’t quite as photograph-worthy as Washington. 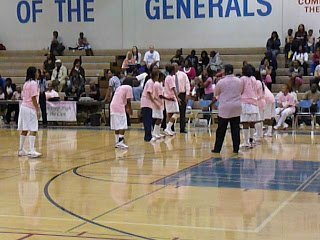 But it is really great to see the popular trend of having breast cancer awareness night-themed games trickle down from colleges and the WNBA to the high school level. I know of at least one other such high school game this month in the Los Angeles area, and it’s awesome. Kejuana Gardner, Reshanda Gray and Tayllor Gipson got Prep off to a strong start in the first quarter, and it took a little while for Lynwood to respond. But behind the dynamic duo of Tyonna Outland and Jasmin Jennings, they did. Prep was up 15-10 at the end of the first quarter. The Generals went on a run in the middle of the second quarter, and they were up 28-16 at 3:17. But then the Knights went on a run, reeling off 11 unanswered points before Gardner took matters into her own hands and drove for the basket with about 30 seconds to go. A dish to Jerronisha Green kept Washington on top 30-27 at halftime. Both teams continued to take it to each other in the third before Prep bore down and made a run about mid-way through. Gray and Gipson were nailing shots and layups while Gardner mostly stuck to assisting them. Washington was up 44-36 at the end of three. Lynwood came out posessed in the fourth quarter, beginning it with a back-door score and continuing to roll with a Jennings three-shot. Outland scored, and suddenly Prep was ahead only 46-43. Gardner, a junior, is one of the old-timers on Washington’s young team, which graduated eight seniors last spring. A freshman sensation two years ago and a team captain now, she took over the point guard role in the fourth quarter that has been rotating between her and two other players this season. Gardner initiated drives and made two of her assists in this period. Gipson, a senior, was on fire last night, and she also let loose with some pretty shots as the clock wound down. Sophomore Gray was part of Prep’s JV City Championship team last year, but she looks like she’s been on varsity all her life. With less than three minutes to go, Gardner dished the ball to her while Gray was standing with her right side facing the basket. No matter, as Gray flung up a sideways shot that went in cleanly. Some fouls on the Generals in the last two minutes whittled their lead down to 3, 55-52, after the Knights hit their free shots. Outland had a chance to cut it to a one-posession game with less than 30 seconds to go, but she missed the shot, forcing the Knights to foul Gipson at 14.5 seconds. Gipson made one foul shot, but on the inbounds Lynwood had only enough time to get one pass off before the final buzzer sounded. Outland finished with 18 points, and Jennings had 12. I was impressed with both players – especially their excellent outside shooting acumen. I wish I knew how many three’s each had, but the coaches for both teams have been slow to put up stats on Super Bowl Sunday. I did talk to one assistant tonight, though, that said both players are getting looked at by some D1 schools. Good deal. Gipson had 18 points for Washington, Gray had 16 points and 10 rebounds (she gets a double-double in at least one and often both of their weekly games now), and Gardner had 13 points, seven steals, three assists, five rebounds and one block. Kiana Furlow added seven points. The Gardner and Gray show continues to impress. Both players are extremely aggressive and decisive in their play. I wrote in my notes at one point in the fourth that “Gray seems to be the only one who really knows how to take a pass from Gardner.” Because Gardner’s passes are always bullet passes; she’s not soft in anything she does in the game. And Gray’s hands are always ready. You hear the “plunk” of the ball in her grip and you know it’s about to go up toward the rim in a way that matches the pass. Gray is turning into a monster. Lynwood, now 11-7, is tops in the San Gabriel Valley League of the Southern Section, so to get to state they’ll face stiff competition. Prep, at 19-3, is first in the City Section Marine League, and after they most likely take the league title, they’ll have to face some sharks like Chatsworth – the favorite to win city. We’ll see, because it’s still early. Prep is doing better right now than anyone thought they would, and they look like they’re starting to gel. End-of-February high school madness is still a long way off. What a great thing that High School girls are getting involved in raising awareness and money got a cure. I agree – it’s never too early for awareness when it comes to this issue.